When someone trusts you. They will hire you. Last week I was in Palm Springs, Cal. for Altitude Summit, THE premiere conference for creative entrepreneurs and stylish social media influencers. It indeed was stylish and creative yet also informational and inspiring. This is my third conference experience and I have to say, I'm addicted. If I could go to more, I would. In fact, I wish all of my clients could have the same opportunity to learn more about social media, email marketing, affiliate marketing and video trends; meet cool sponsors; and pick up some swag. But honestly, the best part of going to these conferences is making truly amazing connections with like-minded individuals. The first summit I attended was in Charleston, South Carolina where I met Amanda Thompson who is from Charlotte, North Carolina. We met at the opening mixer at The Southern C Summit and immediately hit it off. I was impressed with her work creating heirloom jewelry. She knew at the time she was ready to take her brand and marketing up a notch. Soon after I returned to Nashville we started working together on her website. She was a pleasure to work with, open to my suggestions but also confident about how she wanted everything to look. At my first Alt Summit I saw keynote speakers; listened intently when social media influencers gave out valuable tips and tricks about Instagram; and sat in on round tables that covered topics every entrepreneur would need to know about how to promote and market their business. One of my favorite round tables was with a copywriter who spoke on vision and mission statements. Robin Catalano, who is from upstate New York, had by far the best "mini-workshop." Once home from the summit Robin reached out to me about working together on a website for her client, the New York State Berry Growers Association. It was so nice to work with a professional copywriter. I don't get those opportunities very often and I cannot tell you the difference it makes to have such great content. This year at Alt Summit I didn't feel like I had made any real significant connections. At the last session of round tables, I was trying like crazy to get in on the overflowing and popular tables (Robin's email marketing round table was one of those) but ended up sitting at a table I actually have no idea what the topic was about. An attendee who was sitting at the same table started talking to me. She told me she was the founder of the largest and "best" food blogger conference in the country and I told her a little about my branding and design coaching business. As I am interested in being a sponsor at upcoming workshops and summits I asked her about pricing for her sponsorship packages. When she told me how much it was, I replied that it was more than I could afford. She said, "I'd be happy to put your postcard in the swag bag at the conference if you'd like." Guys, I actually became a little emotional because I couldn't believe how kind she was. It wasn't a flashy, stylish, wide-eyed influencer moment — it was a genuine business owner to business owner and woman to woman moment. I was moved by her generosity. All of these connections I made started with an introduction, conversation and a little honest curiosity that flourished into something that was mutually beneficial for each of us. If we had not initially felt trustworthiness toward each other, it would have been highly unlikely we would have ever moved beyond polite niceties. When we think about branding perhaps we think about our visuals like a logo and website but it's so much more than that. 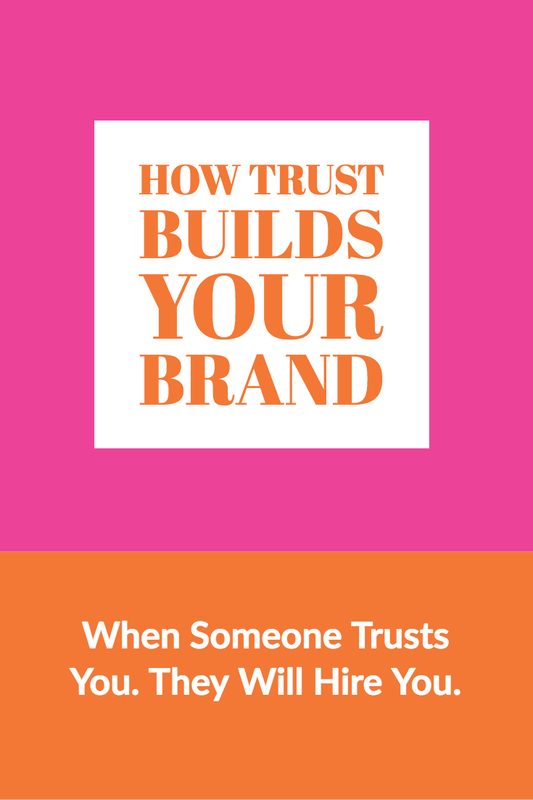 It's about how people connect with you, how you make them feel, what your product or services do to help them and whether or not they trust you. If I had looked disheveled, acted inappropriately, not been able to talk about what I do in a professional manner or had an ugly business card and website, I doubt very seriously business owners would have wanted to work with me. Good branding creates authentic connections which builds trust with your customers. My business primarily has been referral-based. I create quality work to help my clients grow their businesses and in turn, they promote my services so that I can grow my business. It's a win-win situation. Whether you need done-for-you graphic and website designs or personalized design + brand coaching, I have everything you need from A-Z to help you create a distinctive, professional brand. Please reach out and let me know how I can help. Gentle, kind, smart, dedicated, creative, funny, fun, strong, determined are just a few words that describe Michelle. A former teacher at a Nashville inner-city school, Carter-Lawrence Magnet School, she devoted herself to not only teaching her students the curriculum but giving them a safe, happy place to be at least for a few hours. Do you need a professional to review your brand to see if you're on track and can make design suggestions that will improve your visual communicaitons? Well, look no further than a personal website and brand review by a professional graphic and web designer and visual expert. When a group of people come together in harmony to achieve a definite purpose, the increased mental prowess and capacity for intelligence created through this coordination becomes greater than the sum of the intelligence of the individual minds. This intelligence can be tapped into by any member of the group. Mastermind meetings have three essential components: sharing, advising, and accountability. If you want to move forward with your business, this group will get you there faster. You will work better, feel more confident and get the support you need. It's a win/win for the group. Logo design is complex and begins even before pen meets paper. It’s super important as a business owner especially those of you who have to DIY your branding and marketingthat you understand a little technology and a little about graphic and web design.